•You may have edited the network in some way which will require RivEX to compute new node ID numbers. Remember RivEX does not overwrite old fields but simply creates two new fields. 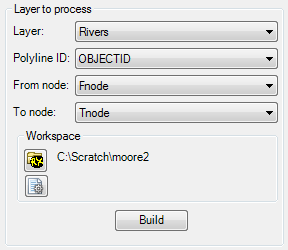 •To build the nodes you must select the layer, polyline ID and old node fields. 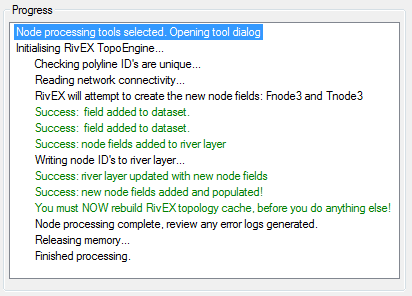 RivEX does not actually use the old node fields, this is simply a requirement of the build data dictionaries process. Set the workspace and press BUILD. •Expand the Nodes tree node, select Run node processing task and press Run Tool button. •The node processing dialog opens. 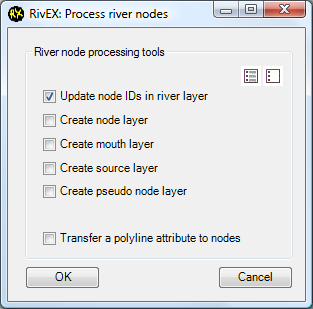 Select the update node IDs in river layer option and click OK.
•RivEX will read the network as if you had chosen it for the first time and process the nodes, an example of a successful tool execution is shown below, note you must press the BUILD button again to allow RivEX to rebuild the topological dictionaries based upon these newly created node ID's.